Diversity: the ability to analyze familiar cultural assumptions in the context of the world’s diverse values, traditions, and belief system as well as to analyze the major ideas, techniques, and processes that inform creative works within different cultural and historical contexts. Goal A: Analyze one’s own cultural values and assumptions. Cultural Self-awareness: Knowledge of how experiences have shaped one’s own cultural rules, and how to recognize and respond to cultural biases, resulting in a shift in self-description. Empathy: The ability to imagine one’s self as another, with another’s interests and emotions, and within another’s cultural rules, biases, and perspectives. Openness: Desire to interact with culturally different others. Interactions with culturally different others should be interpreted broadly, and can include experiences with texts, creative works, or individuals. Goal B: Analyze or compare diverse values, traditions, belief systems, and/or perspectives. Cultural Worldview Frameworks: The history, values, politics, communication styles, economics, or beliefs and practices by which people construe their experiences and make sense of the world around them. Curiosity: Willingness to understand and engage with other worldview frameworks. Application: Ability to engage and learn from different perspectives and experiences; to understand how one’s place in the world both informs and limits one’s knowledge. Goal C: Analyze creative works within diverse contexts. Theory/Criticism/Technique: The set of concepts/principles used to create or evaluate creative works. Themes and Ideas: The concepts expressed in the creative work that are representative of diverse cultures/perspectives. Context: The personal, social, cultural, and historical influences on the creative work. Reflection: The articulation of a personal response to the experience of a creative work. Critical Inquiry: the ability to analyze new problems and situations to formulate informed opinions and conclusions. Goal A: Demonstrate a knowledge base to ask more informed questions and learn more complex concepts. Knowledge: An understanding of the concepts and/or principles in the discipline and how they relate to important questions. Information: Selecting appropriate and credible information based on knowledge of topic and discipline. Analysis: Evaluating a position and/or drawing conclusions on significant questions in the discipline. Goal B: Apply scientific process to solve problems/answer questions. Define Problem/Question: A statement or summary that identifies a problem or raises a question that is relevant to the topic or assignment, appropriate to the discipline, and open to empirical inquiry (i.e., objective observation). Propose Hypotheses: Formulating testable propositions that follow from one particular solution/answer to the problem/question. Identify Methodology: Selecting the appropriate set of procedures to test the hypotheses. Evaluate Results: An objective assessment of the hypotheses based on the empirical evidence gathered from the methodology. Goal C: Apply quantitative and computational processes to solve problems. Information: Identifying and extracting relevant information needed to solve the problem. Methods: Selecting the appropriate methods to solve the problem. Communication: Effectively communicating quantitative concepts or evidence consistent with the purpose of the assignment. Effective Communication: the ability to develop and present ideas logically and effectively in order to enhance communication and collaboration with diverse individuals and groups. Goal A: Students will use appropriate conventions and strategies in oral communication for various audiences and purposes. Central Message: The topic, thesis, or main point of the communication that is consistent with the purpose of the assignment. Organization: The grouping of material in the communication, including a specific introduction, conclusion, sequenced material within the body, and transitions. Supporting Material/Evidence: Explanations, examples, illustrations, statistics, analogies, quotations from relevant authorities, or other kinds of information or analysis that support the central message. Context and Audience: The people and situations surrounding the communication, including the cognitive, social, and cultural factors that influence the audience and communicator. Verbal and Nonverbal Delivery: Posture, gesture, eye contact, vocal expressiveness (loudness, tone, emphasis), and vocal fillers (“um,” “uh,” “like,” “you know,” etc.). Goal B: Students will use appropriate conventions and strategies in written communication for various audiences and purposes. Control of Syntax and Mechanics: The use of language to communicate meaning, including word choice, sentence and paragraph structure, grammar, punctuation, and spelling. Goal C: Students will apply appropriate verbal and nonverbal strategies to promote collaboration. Individual Contributions: The contributions of a single student that advances a group project, including the timely completion of assigned tasks, thorough and comprehensive work, articulating the merits of alternative ideas or proposals, building constructively upon the contributions of others, and being punctual, focused, and prepared. Fosters Constructive Team Climate: Student behaviors that promote collaboration among group members, including being respectful and positive, motivating and assisting teammates, and engaging with teammates in ways that facilitate their contributions. Responsible Living: the ability to address real-world problems and find ethical solutions for individuals and society. Goal A: Apply ethical principles to solve problems. Ethical Awareness: Awareness of the core beliefs that consciously or unconsciously influence one’s own and others’ ethical conduct and reasoning. Core beliefs can reflect one’s environment, religion, culture, or training. A person may or may not choose to act on their core beliefs. Ethical Issue Recognition: Recognition of various ethical issues and their interconnections in complex contexts (i.e., the obvious and subtle connections between/among the sub-parts or situational conditions of a scenario that bring two or more ethical dilemmas/issues into the problem; e.g., relationship of production of corn as part of the climate change issue). Ethical Application: The application of different ethical theories (e.g., utilitarian, natural law, virtue) or ethical concepts (rights, justice, duty) to analyze the ethical issues of a problem. Goal B: Make appropriate recommendations based on discipline specific knowledge to address an issue or scenario and evaluate the effect that decisions have on the well‐being of self, others, society and/or environment(s). Issue Recognition: Recognition of various issues that affect well-being and their interconnections in complex contexts. The interconnections of issues in complex context refer to the obvious and subtle connections between/among the sub-parts or situational conditions of a scenario that bring two or more dilemmas/issues into the problem (e.g., relationship of health screenings to increased health care costs). Analysis of Knowledge: the ability to extend discipline based knowledge to decision making and/or develop a recommended course of action based on discipline specific knowledge. Impact of Decisions: The consequences—good or bad—of decisions on the well-being of self, others, society and/or environment(s). Goal: Demonstrates an understanding of the mission, goals, and core values of the UCA Core, how the four core competencies relate to the mission and goals, and how the structure of the UCA Core contributes to the student’s education. Understanding of the UCA Core: Knowledge of the meaning and interconnections of the components and requirements of the UCA Core as well as their contribution to the student’s education as a whole. The UCA Core’s upper-division requirements became effective Fall 2015. Students should consult their academic advisors for clarification about upper-division requirements that apply to them. 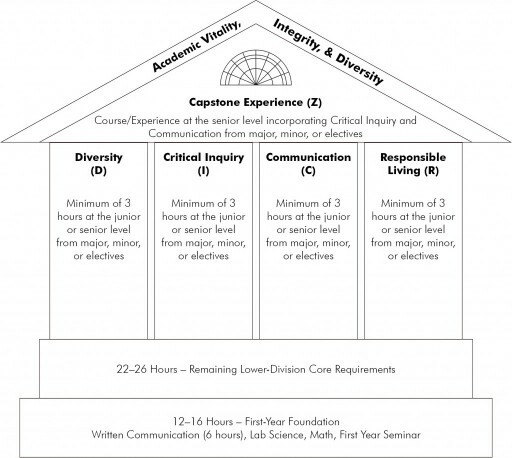 In order to satisfy upper-division core requirement, students must take upper-division courses that address outcomes in each of the four competency areas of the UCA Core: Diversity (D), Critical Inquiry (I), Effective Communication (C), and Responsible Living (R). In addition, all student must take a course designated as a Capstone Experience (Z). These courses may also count as major, minor, or elective requirements, and except for the Capstone course one course may satisfy up to two Core requirements. Follow this link for a current list of upper-division UCA Core courses: UD UCA Core Lists. For information about upper-division UCA Core courses specific to your major, please consult this Undergraduate Bulletin, your program’s Academic Map, and your advisor.